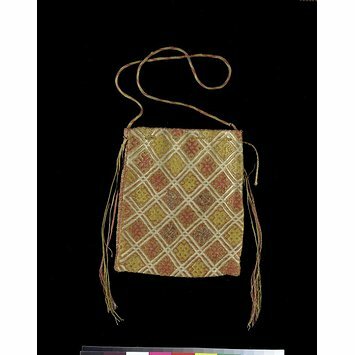 This pretty little bag is embroidered in crimson, yellow and white silk showing a trellis pattern forming spaces in which are geometric devices. Four of the spaces on each side are ornamented with a pelican in her piety pecking its breast, interlaced blossom devices, a curved rendering of the gammadion (symbol of the Cross) and the letter 'M' worked in gold thread. These symbols suggest the bag had a religious use. It may originally have contained relics. A length of silk embroidered linen folded over into a bag, sides stitched together decoratively in silk. Crimson, yellow and white silk embroidery in short stitches of trellis pattern forming spaces in which are geometric devices, four of the speces on each side are ornamented with a pelican in her piety pecking its breast, interlaced blossom devices, a curved rendering of the gammadion and the letter 'M' worked in gold thread, couched. 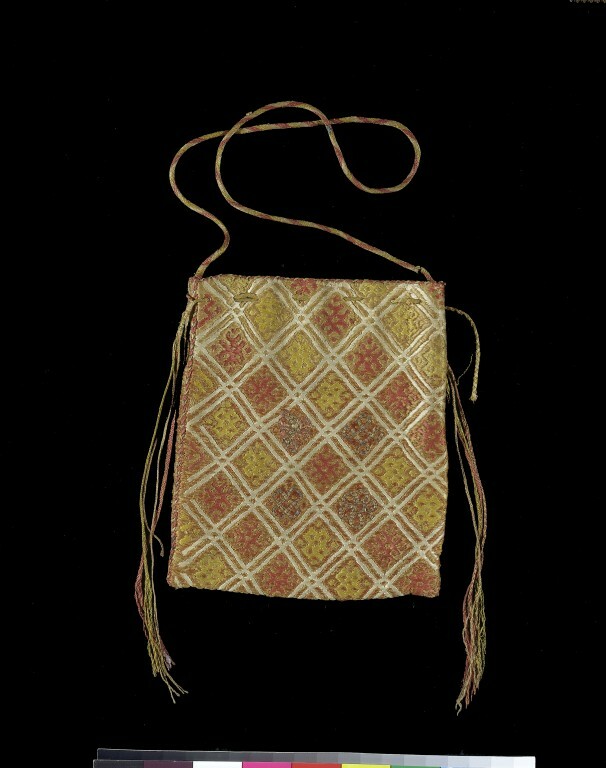 Lining of red plain woven silk, drawstring opening with cord and 'tassels' at each end of opening made up of similarly coloured silks used in embroidery. Silk embroidered linen bag with geometric pattern and pelican, gammadion and letter M in gold.